Four-hundred (400) California Pastors to attend the four-day Church United Awakening Tour in Washington, D.C.
Plan 10+ Regional Briefings (events intended to connect, build pastoral relationships, and pray with elected officials). Two-hundred (200) California Pastors to attend the two-day Church United Awakening Tour in Sacramento, California. To see a united church transform California’s government for Christ. One hundred fifty-seven California pastors at the Church United Awakening Tour in Washington, D.C.
Church United is changing and shaping the moral culture of our communities in California. The strategy is to equip pastors as culture-changers by sending them to Washington, D.C. and Sacramento, California for annual Awakening Tours. These events have built a 500 (and growing) California pastoral network. The tours are followed by Regional Briefings and further-developing personal relationships amongst Regional Pastors of Influence. Church United is igniting the fire and desire for change in pastors who are attending the tours. Watch the Washington, D.C. 2017 video to catch a glimpse of the pastoral resurgence happening in California by clicking here. Beginning with six pastors in 2014, 27 pastors in 2015, 70 pastors in 2016, and 157 pastors in 2017, the number of pastors attending the Awakening Tour(s) movement is steadily growing! The Washington, D.C. conference is a boot camp where pastors hear high-profile leaders share about the current spiritual crisis and activate pastors to change culture. Pastors then return to California on fire to preach Jesus boldly and speak a biblical worldview to their congregations. Church United is strategically inviting Pastors of Regional Influence across the State of California to attend the Washington, D.C. and Sacramento, California events – and then selecting key pastors to receive scholarships for both conferences. The fruit from the Washington, D.C. and Sacramento Awakening Tours has been profound! Pastors are sharing their transformational experiences by bringing other pastors with them, and then activating other pastors and their congregations tenfold. Some of the amazing results are transforming lives for Jesus and positively impacting numerous communities! Watch the Church United Impact videos to see how Church United stops evil, promotes good, stands up against injustice, and implements policies that represent a biblical worldview. Each city has different spiritual problems, and pastors know how to lead their churches in addressing those needs. The results from the Awakening Tours are amazingly profound! Pastors are encouraging other pastors and their congregations to engage in their city’s public square, as well as at the county and state levels. 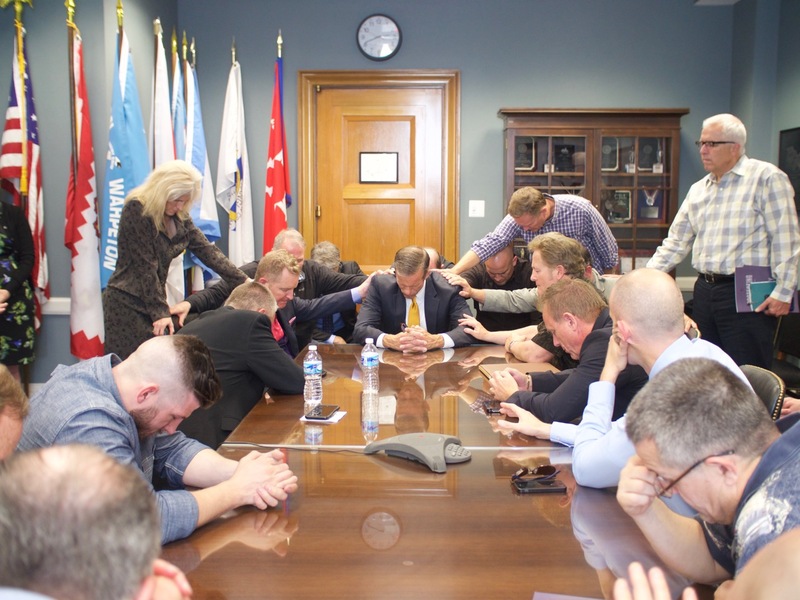 California pastors laid hands on U.S Senator John Thune while praying for him and our country. Not pictured are the numerous chairs lined against the walls of the conference room that were filled with California pastors. The Church United Awakening Tours focus on the spiritual heritage of our country and state with nationally-known speakers, including elected officials (U.S. Senators, Representatives, State Senators, and Assemblymen) who fear the Lord and vote in favor of a biblical worldview. While at the state and nation’s Capitols, Church United schedules appointments with elected officials to build friendships and pray for them. Getting pastors to Washington, D.C. and Sacramento, California is the igniting catalyst! A scholarship to send a pastor(s) to D.C. and Sacramento will provide more than just attendance at the annual Watchmen events. The Founder’s role is to build and develop ongoing relationships with these Pastors of Influence statewide. Through these friendships, he is able to host regional and monthly meetings to stoke the fire that originated in D.C. and Sacramento in order to help facilitate cultural change in California. After the conferences, the connection points for California pastors are the Regional Briefings. These Briefings reconnect pastoral relationships, recruit other pastors from the area, and ensure that Influential Regional pastors are up-to-date with current events.